(WILMINGTON, Del., April 18, 2018) – AstraZeneca today announced that the US Food and Drug Administration (FDA) has approved TAGRISSO® (osimertinib) for the 1st-line treatment of patients with metastatic non-small cell lung cancer (NSCLC) whose tumors have epidermal growth factor receptor (EGFR) mutations (exon 19 deletions or exon 21 L858R mutations), as detected by an FDA-approved test. The approval is based on results from the Phase III FLAURA trial, which were presented at the European Society of Medical Oncology 2017 Congress and published in the New England Journal of Medicine. The FLAURA trial compared TAGRISSO to current 1st-line EGFR tyrosine kinase inhibitors (TKIs), erlotinib or gefitinib, in previously untreated patients with locally advanced or metastatic EGFR-mutated (EGFRm) NSCLC. TAGRISSO met the primary endpoint of progression-free survival (PFS) (see table below). PFS results with TAGRISSO were consistent across all pre-specified patient subgroups, including in patients with or without central nervous system (CNS) metastases. Overall survival data were not mature at the time of the final PFS analysis. Safety data for TAGRISSO in the FLAURA trial were in line with those observed in prior clinical trials. TAGRISSO was generally well tolerated, with Grade 3 or higher adverse events (AEs) occurring in 34% of patients taking TAGRISSO and 45% in the comparator arm. The most common adverse reactions (≥20%) in patients treated with TAGRISSO were diarrhea (58%), rash (58%), dry skin (36%), nail toxicity (35%), stomatitis (29%), fatigue (21%) and decreased appetite (20%). TAGRISSO received its first approval for 1st-line use based on the FLAURA data in Brazil in patients with metastatic EGFRm NSCLC on April 16, 2018. AstraZeneca partnered with Roche Molecular Systems to develop the cobas® EGFR Mutation Test v2 as the companion diagnostic for TAGRISSO. The diagnostic is simultaneously approved as a tissue- or plasma-based test, to identify patients with EGFRm NSCLC who are eligible for 1st-line treatment with TAGRISSO and as a tissue or plasma-based test to identify patients with EGFR T790M mutation-positive NSCLC whose disease has progressed on a 1st-line EGFR TKI. Lung cancer is the leading cause of cancer death among both men and women, accounting for about one-quarter of all cancer deaths in the US, more than breast, prostate and colorectal cancers combined. Approximately 7-23% of patients in Western populations, and 30-50% of patients in Asia have tumors that contain activating mutations in epidermal growth factor receptor (EGFR). These patients are particularly sensitive to treatment with EGFR tyrosine kinase inhibitors (TKIs), which block the cell-signaling pathways that drive the growth of tumor cells. Tumors almost always develop resistance to EGFR-TKI treatment, however, leading to disease progression. Approximately half of patients develop resistance to approved EGFR-TKIs such as gefitinib, erlotinib and afatinib due to the EGFR T790M resistance mutation. There is also a need for medicines with improved central nervous system (CNS) efficacy, since approximately 25% of patients with EGFR-mutated NSCLC have brain metastases at diagnosis, increasing to approximately 40% within two years of diagnosis. 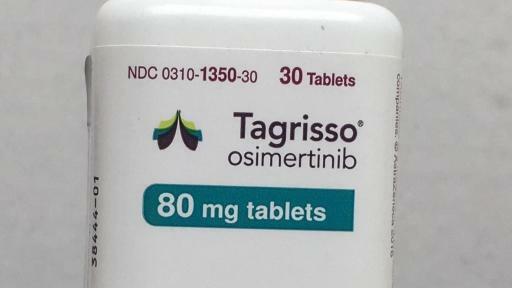 TAGRISSO® (osimertinib) is a third-generation, irreversible EGFR-TKI designed to inhibit both EGFR-sensitizing and EGFR T790M-resistance mutations, with clinical activity against CNS metastases. 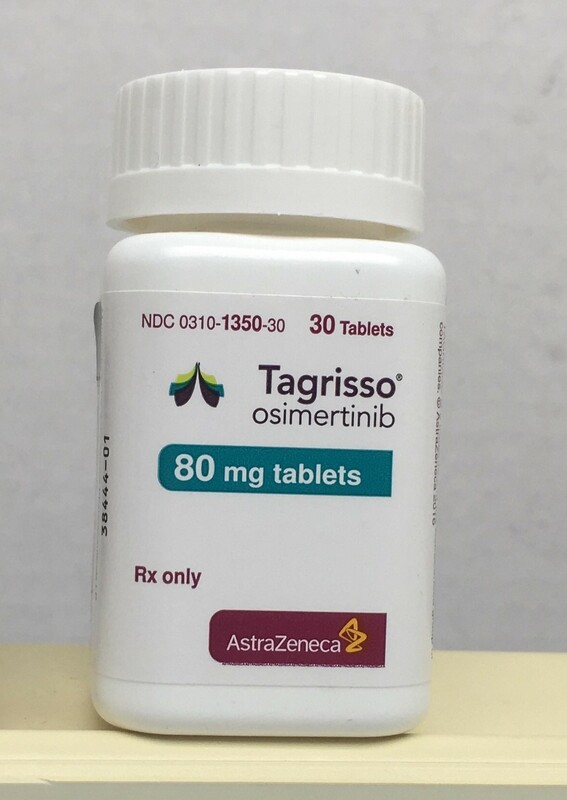 TAGRISSO40mg and 80mg once-daily oral tablets have been approved in the US and Brazil for 1st-line EGFRm advanced NSCLC, and in more than 75 countries including the US, EU, Japan and China for patients with EGFR T790M mutation-positive advanced non-small cell lung cancer . TAGRISSO was originally granted Accelerated Approval by the US Food and Drug Administration (FDA) in 2015 for the 2nd-line treatment of patients with metastatic EGFR T790M mutation-positive NSCLC, as detected by an FDA-approved test, whose disease has progressed on or after an EGFR-TKI therapy. In March 2017, the FDA followed up with a full, confirmatory approval based on data from the Phase III AURA3 trial. The FLAURA trial assessed the efficacy and safety of TAGRISSO 80mg once daily vs. standard-of-care epidermal growth factor receptor (EGFR) tyrosine kinase inhibitors (TKIs) (either erlotinib [150mg orally, once daily] or gefitinib [250mg orally, once daily]) in previously-untreated patients with locally advanced or metastatic EGFR mutation-positive non-small cell lung cancer . The trial was double-blinded and randomized, with 556 patients across 29 countries. The cobas® EGFR Mutation Test v2 is a real-time PCR test for the qualitative detection of 42 defined mutations of the EGFR gene in exons 18-21, including L858R, exon 19 deletions, and T790M mutations. This in-vitro diagnostic (IVD) test is the first and currently the only FDA-approved EGFR test to include both tissue and liquid biopsy (plasma) as patient sample types for testing. AstraZeneca is committed to developing medicines to help every patient with lung cancer. We have three approved medicines and a growing pipeline that targets genetic changes in tumor cells and boosts the power of the immune response against cancer. Our unrelenting pursuit of science aims to deliver more breakthrough therapies with the goal of extending and improving the lives of patients across all stages of disease and lines of therapy. AstraZeneca has a deep-rooted heritage in Oncology and offers a quickly-growing portfolio of new medicines that has the potential to transform patients’ lives and the Company’s future. With at least six new medicines to be launched between 2014 and 2020, and a broad pipeline of small molecules and biologics in development, we are committed to advance Oncology as a key growth platform for AstraZeneca focused on lung, ovarian, breast and blood cancers. In addition to our core capabilities, we actively pursue innovative partnerships and investments that accelerate the delivery of our strategy, as illustrated by our investment in Acerta Pharma in hematology. AstraZeneca is a global, science-led biopharmaceutical company that focuses on the discovery, development and commercialization of prescription medicines, primarily for the treatment of diseases in three therapy areas – Oncology, Cardiovascular, Renal & Metabolism and Respiratory. The Company also is selectively active in the areas of autoimmunity, neuroscience and infection. AstraZeneca operates in over 100 countries and its innovative medicines are used by millions of patients worldwide. For more information, please visit www.astrazeneca-us.com and follow us on Twitter @AstraZenecaUS.